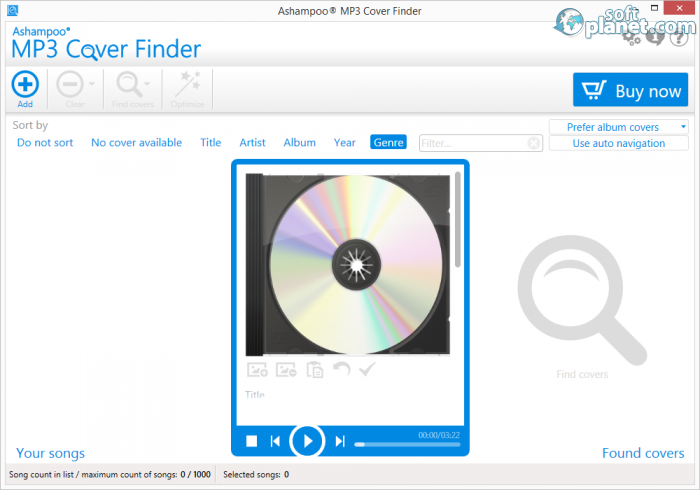 SoftPlanet makes it possible for everyone to get free Ashampoo MP3 Cover Finder download directly from our servers. There is no registration needed for downloading. To every music fan the most important thing is music itself, but the true fan knows that the styling of the video and also the cover of the album contains information about the ideas and inspiration of the artist. That's why it's good to have the cover of the album which you are listening to, and here Ashampoo MP3 Cover Finder 1.0.11 may help. The product created by Ashampoo GmbH & Co. KG scours the Internet for the album cover and presents it with a simple and quick search. But keep in mind that the free version is limited to 10 days with the option to extend it with 10 more days if you register. 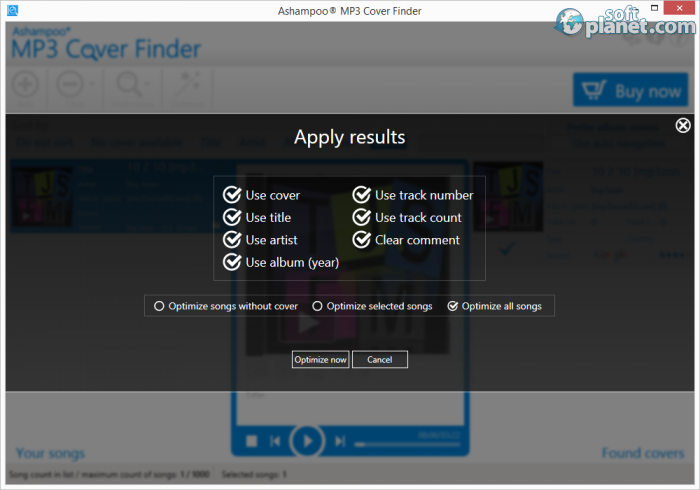 Finding the cover of your song is relatively easy with Ashampoo MP3 Cover Finder; by simply adding the song as a file, from a folder, or from your music, the search may start, but there is limitation to the available format, which is limited to MP3 and M4A. This is a big disadvantage as now the digital music is offered in varying formats and that can hinder your attempts to find the best possible album cover. One of the great features of Ashampoo MP3 Cover Finder 1.0.11 is its search engine which checks the Internet for the right cover, and also gives you different options, if there are any. The interface of the program is stylish, it gives you all the options right away, without making you lose yourself in too much icons or buttons. Another good feature of the program is that there are 32 available languages for the application, and they can be changed at any time from the “Edit program settings” menu. Also you can play the song for which you are searching cover, preventing, in this way, the confusion that may occur. A very useful moment is that while its searching for the song, it gives you the information for the exact time it will take to end, so that you can plan your timeline ahead. After finding the right cover you can optimize the songs to use the information that was found for the title, artist, album, track number, track count and of course to use the best cover. Ashampoo MP3 Cover Finder gives you the options to delete the excess cache, speed up or decrease the Internet connection speed and hide some options. Also you can change the theme color. In general Ashampoo MP3 Cover Finder restricts its usability because of the limitations of the available formats to only MP3 and M4a. This, added to the short trial usage period makes it not so good of an application, but perhaps the full paid version may deserve some more attention. 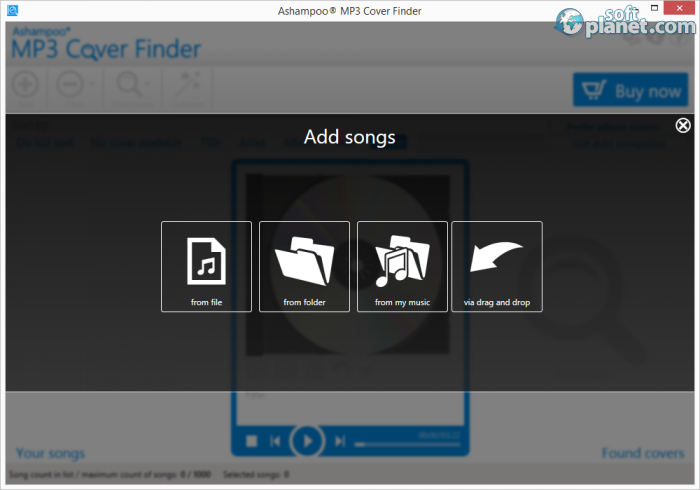 Ashampoo MP3 Cover Finder is VIRUS-FREE! Our security scan shows that Ashampoo MP3 Cover Finder is clean from viruses. The current version of Ashampoo MP3 Cover Finder has been scanned by our system, which contains 46 different anti-virus algorithms. That ensures that Ashampoo MP3 Cover Finder 1.0.11 is 100% safe for your computer.